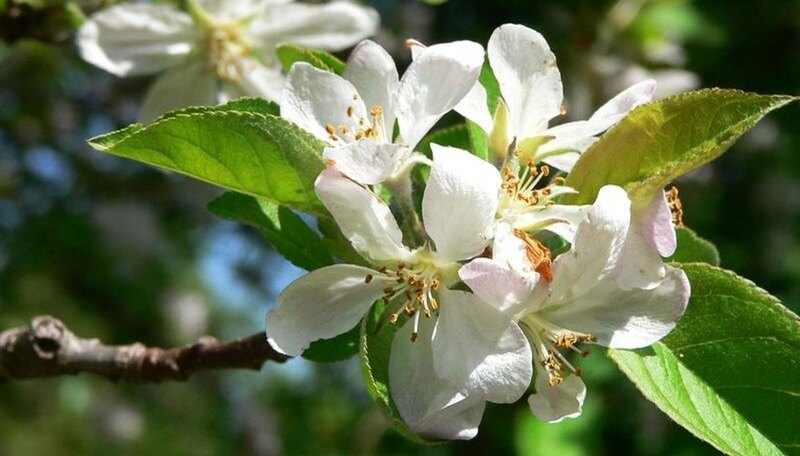 Flowering plants or angiosperms--including the apple tree--reproduce by transferring pollen from the male organ or stamen of one blossom to the female organ or pistil of another. Some flowering plants require no pollinating partner--the flowers are sel- fertilizing. Apple trees are not self-compatible--to yield fruit, apples require fertilization by a different apple variety. Pollination of apple blossoms depends primarily on wild or domestic honeybees gathering both pollen and nectar for their hives. Other insects and bees--such as the solitary orchard bee--carry pollen from blossom to blossom but honeybees have been the most reliable pollinators. Heavy crops of fruit become vulnerable to late frost, insect pests and a variety of damaging fungal infections. Damaged fruit often drops before seeds develop. Mature fruit naturally scatters through the activities of animals and birds who spread the seeds in their droppings. Few naturally-seeded apples have any genuine commercial value--fruit is often small and bitter and varies from tree to tree. Common commercial apple cultivars like Red or Golden Delicious trees develop by grafting rather than growing from seed. Cultivars represent the scattered parts of what was one individual tree with exceptional fruit. Twigs or scions from the valuable individual joined to the stems of seedling apple trees by careful splicing or grafting develop into a clone of the desired cultivar. Cultivars have sometimes been developed by careful crossbreeding of important varieties. Fencerows that sheltered a wild seedling also yielded some of the favorites. When an important tree is found, scions cut from it provide the growing material of new orchards. Sports or mutations of individual branches are rare but potentially of equal importance. Unusual apples picked from a single branch may mark a valuable find. In wild settings apples often spread and become thickets by sending up sucker shoots from their extensive root systems. Though the thickets technically constitute one individual tree, if the parent tree dies or the root itself is severed the sucker sapling often survives. Trees in old orchards often die of infections and heart rot but may live on as new trees sprouting from sections of old root. These new trees usually suffer from the same established diseases as the tree that spawned them. In grafted trees the root suckers and water shoots--suckers growing from the base of the trunk--threaten the survival of the grafted cultivar. Suckers grow more vigorously than the grafted section and if left unchecked overtake it and crowd it out. To protect the desired cultivar, prune off all suckers and water shoots.